As much as I love Christmas lunch – turkey and all the trimmings, Christmas pudding, mince pies and brandy butter and then Stilton, I think that half the fun is also in the delicious leftovers. Even when I roast a chicken for a weekend lunch I take the time to throw in some extra potatoes, cook some extra vegetable and make more stuffing than I need. It really makes the next few meals so much quicker, easier and more delicious. I know that strictly speaking there is no such things as leftover chocolate(s), but if you have some spare these pretty verrines are very easy to make, and are sure to impress. They are rich and indulgent, but really not too large so considering it is Christmas time they could almost be good for you! How to Make Layered Chocolate Pots! 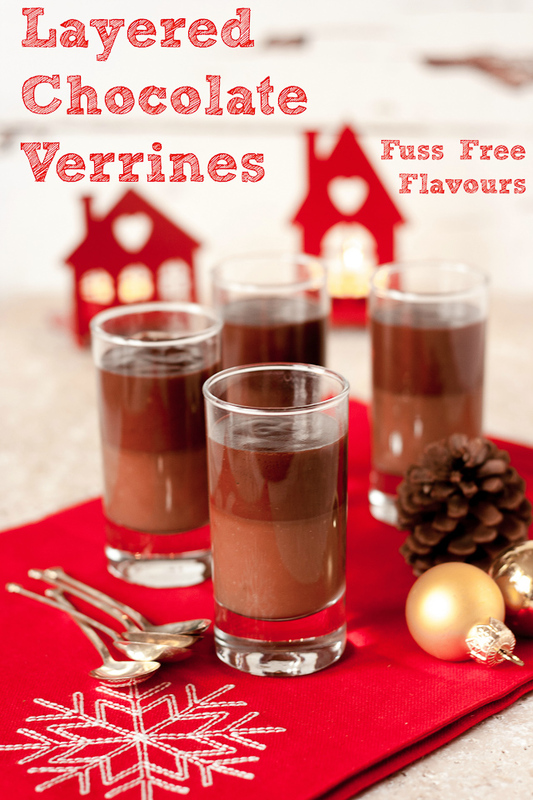 If you try this Layered Chocolate Pots please tag #FussFreeFlavours on Instagram or Twitter. It is amazing for me when for me when you make one of my recipes and I really do love to see them. You can also share it on my Facebook page. Please pin this recipe to Pinterest too! Thanks for reading Fuss Free Flavours! 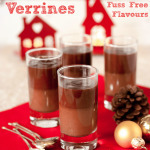 Easy to make, but oh so impressive layered chocolate pots made with several types of chocolate. Simply finely chop each type of chocolate and place in separate bowls. Heat 100ml of the cream to just below simmering, remove the pan from the heat and add the chocolate. Stir well until the chocolate has melted into the cream you might need to either heat it very gently or add a little milk to thin it. Divide the chocolate cream mix between the verrine glasses trying not to pour it down the side of the glass; I use either a jam funnel or pour the chocolate mixture from a warmed jug, wipe any splodges from the inside of the glass place in the fridge to set, before adding the next layer. Served chilled with a little extra cream. All sorts of types of chocolate will work well here – bars, flavoured, creme centres, toffees – as long as it will melt smoothly you can use it. Try adding orange zest, or use a little less cream and add a little brandy, whiskey or liqueur of your choice.